Practice Area: Driving range with grass tees, sloped putting green (very indicative of actual greens), chipping area. 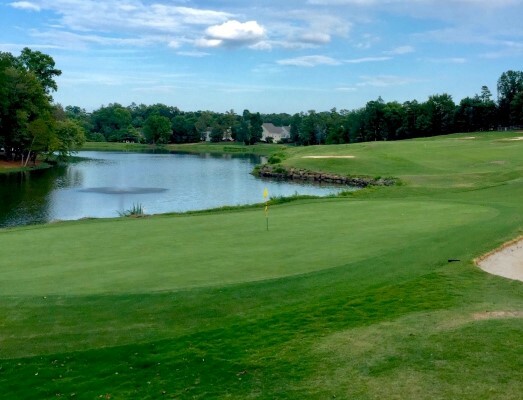 Description: This residential course near Huntersville lives up to the Creek in its name, with water hazards coming into play on 10 holes. It has experienced some decay in course conditions over the past several years due to the turnover in management. 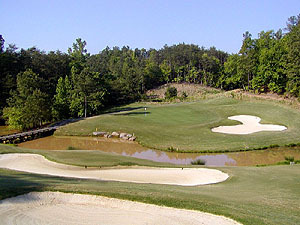 It used to be one of the better kept and most challenging public courses in Charlotte. I have my fingers crossed that it will return to its former status in the future. Notes: Highland Creek came under new management in 2014 and memberships & discounts can now be shared across its former sister courses in the old Carolina Trail -- The Divide, Tradition, Birkdale, and Waterford. B-Man's Take: I used to play this course quite a bit with a friend who lived in the neighborhood. The Carolina Trail demise took a serious toll on the course conditions unfortunately. At times over the past few years (2016-2018), the course has been virtually unplayable. If you play here, please post a review and let us know how it's shaping up. As for the course itself, some of my toughest rounds have been played here. Easy to lose golf balls in the namesake creek, which runs along seemingly every hole. You must be accurate off the tee and with approach shots to stay out of trouble here. Otherwise, you're in for a long round. My favorite hole is #18, the signature 487yd par 5 finishing hole that is reachable in two provided you carry the water all along the right side with 2 shots. Several hell-holes for me on this course, but in particular the 419yd par 4 4th hole is a brutal dogleg left because of a narrow target for your approach, guarded by trees and bunkers. The 560yd par 5 12th is also a brute, with two tough-to-hit fairways and an approach over water. 9/28/18 - Msg Board Posting by The B-Man titled "Highland Creek closing next week"